At the height of World War II, young naval lieutenant John Schaeffer helped construct supply bases in the South Pacific—building airstrips, mobile hospitals and roads on islands dotted across the embattled ocean. At the age of 99, more than 70 years later, his memory of those days was undimmed. He could still recite the dimensions of the Quonset huts they built on those bases and name every island he visited on his three tours of duty with the Seabees. John, who passed away on June 5, just a few weeks shy of his 100th birthday, was a former resident of Beardstown and Virginia, Illinois. A proud veteran, he counted his military service as a defining experience. After some thought, he added a fourth segment: the 14 years he spent as a resident in a Springfield senior living complex and the setting for his 100th birthday party. John celebrated his birthday on May 30, thanks to the Sharing Wishes Fund. That fund was established in 2012 by the Memorial Medical Center Foundation to grant the wishes of Hospice patients and their families. 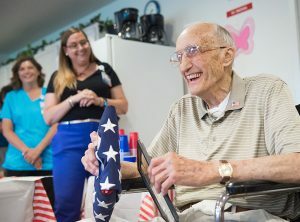 “He wanted to do this when he was still able to enjoy it,” said Memorial Home Hospice social worker Jessica Roth, LSW, noting that John’s official birthday wasn’t until June 21. But concerns about his health led organizers to set the date of the party a little earlier. “He told me on one visit that he really wanted to see a cake with ‘Happy 100th Birthday’ on it,” she added. About three dozen of his friends and neighbors helped him share that cake, which was decorated in red, white and blue icing. During the party, John was also honored for his military service with a We Honor Veterans ceremony. These events are part of a nationwide program presented by the National Hospice and Palliative Care Organization and are held by Memorial Home Hospice to recognize veterans in hospice care. John served three years, five months and one day in the United States Navy, attaining the rank of lieutenant before his discharge in 1945. He enlisted in the Seabees, officially known as the United States Naval Construction Battalions, in 1942. After the war, he turned that construction experience into a career in engineering services. One of his prized possessions was a globe painted with three lines to trace his journeys in the Pacific during his tours of duty. The first line followed his travels during the Guadalcanal Campaign, the first major Allied offensive against Japan. The second line traced the Mariana Campaign, in which US forces constructed bases across the Pacific. The third line hugged the coast of Alaska and the west coast of the US. At the time of his death, John was writing a book about his life, including his experiences in World War II. “We’re so grateful that he’s taken the time to write his memories down so he can pass it along to others—so we will never forget,” Hospice chaplain Victor Angulo said during the We Honor Veterans ceremony, which included presentation of a plaque and an American flag. John asked that the other veterans at the party be recognized as well. While Angulo read a poem recognizing their service, about ten other men and women rose to their feet to join in the honor. Roth said she enjoyed getting to know John during the past few months and hearing about his century of experiences. Throughout his party, friends stopped at the table where John sat to wish him a happy birthday. Sometimes, he responded with one of his famous stories or a memory they had shared together. But when asked if he was enjoying his party, he didn’t need any words—just a smile and two thumbs up. A wonderful man. Loved to sing and tell about his life. I was privileged to know him and his wife. John was the last of four ‘boys’ and his stories never changed! John was the last of the Schaeffer boys and my uncle. John would regale us with song stories and the greatest humor! Loved him like my dad…honored him as a patriot….respected him as a mentor….miss him like all git out! Great post, reminded me a lot about my dad, a Korean War veteran who died in the veterans hospital in CA over a year ago. My brother had went home for awhile went he got the call from the hospital. He arrived to find out that they had placed the body on a gurney, draped a flag over him with a flag and a wreath and several soldiers wheeled him through the hospital while “Taps” was played. They do it for everyone that dies there even when family is not around and other vets, if they can, come out of their rooms to watch. Your story about Mr. Roth is awesome, he was able to be with family when he passed. Even though my dad was so honored for which I will forever cherish, I know that dad would have traded it to have passed when he had all of his family around like Mr. Schaeffer had, what a way to be blessed and honored.